The Civil Affairs Section of the UN Mission in Haiti (MINUSTAH) is overseeing and financing a rehabilitation project worth approximately US $100,000 that will bring electricity, water and security to a 91-year-old state-run home for the elderly, located in the Bel Air neighborhood of the capital Port-au-Prince. The women’s wing of the cash-strapped home was destroyed in the January 2010 earthquake, and the facility currently houses 29 men and 36 women officially registered residents on the main floor of its formerly men’s wing, while the second floor houses additional elderly suffering from illnesses and, in some cases, members of their families. The rehabilitation project is expected to last three months, employing 15 craftspeople per day. 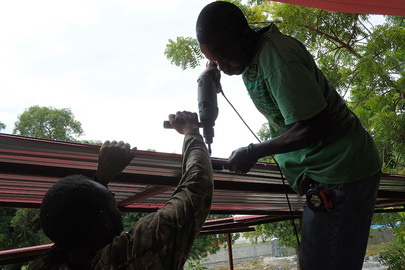 Workers install roofing over a wheelchair ramp.